From May 2010, this page is no longer being updated. All of our news is being posted on a wiki hosted by Wetpaint.com. Kick the Cat was formed in Edinburgh in 1995 and has been demonstrating this unique (to Scotland, as far as we're aware) dance style at various venues around the Central Belt since then. 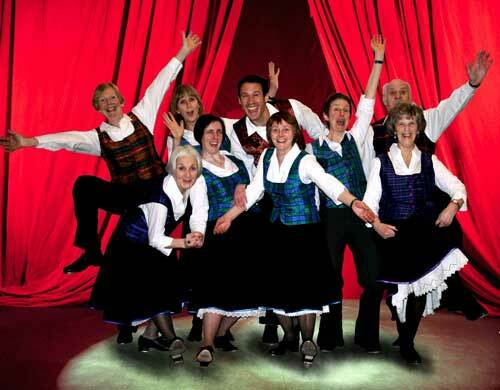 The Appalachian clogging style danced by Kick the Cat is a mixture of different dance styles which were taken to the New World by European settlers from the 17th century onward. The settlers' society became polarised and, by the 19th century, it could be divided into three groups: the merchants and tradesmen, wealthy farmers, and the backwoods people. The last group was the least affluent and mobile. The social dancing of the wealthier groups was influenced by the French courts and Playford's English country dances. By contrast, the backwoods people danced lively reels, jigs and square dances, brought from their native countries. Dance steps copied from the Native-Americans and the African slaves were added into this cultural melting pot and the resulting dance style was known as flat footing, buck dancing or hoofing. Appalachian clogging started to become popular in Britain some 20 or so years ago. The dancers usually wear shoes with toe taps and routines can consist simply of steps, or they may include traditional square dance figures, or even Contradance reels of 3 and 4 couples. The steps often have descriptive names, such as Cowboys & Indians, Wrens, Cajun Lady, and Charleston. ‘Kick the Cat’ is the name of a step and we thought it made a good name for the group. All of our dances are now available to download from our wiki as PDF files. E-mail kickthecatcloggers[@]hotmail.co.uk for more information.